One look at Bridgedale Midweight Control Fit Winter Sports Socks reveals that they are no ordinary ski socks. 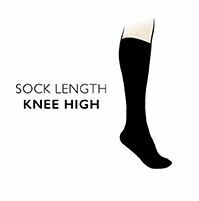 The technical knit method employed by Bridgedale means that not only are these midweight socks anatomically designed for 360o precise, targeted insulation and cushioning, but the actual yarn mixture varies as well. Friction free zones are created with slicker yarn for easy boot entry and heel retention, whereas the WoolFusion® blend of Merino Wool and Endurofil provides warmth, softness and moisture control. A Fine knit cushion toe box and a high friction forefoot improves edge feel for more control, while tapered cushioning and light grade compression improves fit, impact protection and comfort.